The 2018 Virgin Australia Supercars Championship will kick-off this weekend at Adelaide Street Circuit. Twenty-six drivers are entering the season. The championship season, which will end with Newcastle 500 event on November 24-25, features 16 events with 31 races, expanding from fourteen to sixteen venues. The Melbourne Grand Prix Circuit, which hosted the non-championship round since 1996, is now included in the championship with the same 4-race format. The completely new venue on the VASC calendar is the Bend Motorsport Park in Tailem Bend, South Australia. The event would be known as the Bend SuperSprint. There are lots of changes among the teams and drivers. Two best-placed squads from the previous championship, DJR Team Penske (Ford) and Triple Eight Race Engineering (Holden), retain the same line-up of drivers who took the first four places in the last year’s championship (Jamie Whincup, Scott McLaughlin, Fabian Coulthard and Shane van Gisbergen). 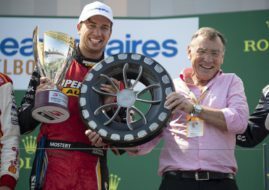 Prodrive Racing Australia changed its name to Tickford Racing and announced four Ford Falcons, three for ‘old drivers’ (Mark Winterbottom, Cameron Waters, Chaz Mostert) and one for rookie Richie Stanaway. As we already published, Walkinshaw Racing was rebranded as Walkinshaw Andretti United, retaining Scott Pye and James Courtney as drivers in their Holdens. Two more teams will run Ford Falcons. Matt Stone Racing will switch from Super2 Series to Supercars Championship, together with 2017 Super2 champion Todd Hazelwood who will fight for Rookie of the Year honors in 2018. Another new team in the VASC is the 23Red Racing, established after Phil Munday bought 60% stake of Lucas Dumbrell Motorsport. The team would run the #230 Ford for Will Davison, who left Tekno Autosports. As a replacement for Davison, Tekno Autosports hired rookie Jack Le Brocq. Two more rookies are James Golding in the #34 Wilson Security GRM Holden and Anton de Pasquale in the #99 Erebus Motorsport Holden. Nissan Motorsport will run four Altimas, retaining Rick Kelly, Michael Caruso and Simona de Silvestro. The #7 Nissan will be driven by Andre Heimgartner as a replacement for retired Todd Kelly.